Script Alchemy: The Nerve of the Gal Re-Writing History! However, I take heart; I’m in good company. As keynote speaker, Tracy Chevalier (author of Girl with a Pearl Earring) said at the recent Historical Novel Society Conference (2016) in Oxford, "It isn’t like we all set out to write historical fiction". As it happens, my experience of coming into historical fiction was much like Tracy’s. Like for her, there came a time when I wanted to know about my ancestors: who they were, where they came from, what kind of lives they led. I wanted to know something of their occupations, things that happened to them, what events went on around them. Anyone who’s done any genealogy will know how addictive it is. It’s like being a private investigator into your ancestors’ lives. You start off by just wanting to know their names, but soon you want to know why this person or that person might’ve been absent at a particular time during a census, or why another person might have come to stay. · the third son after the father. (the girls were likewise named after the mother’s mother, the father's mother then the mother). 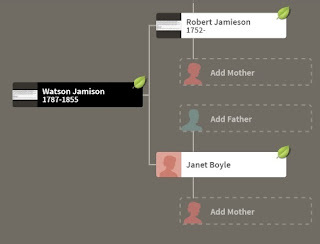 That the first Watson Jamieson had children with three women meant that two of his sons called their first son Watson. And those boys, in turn, so-named their third son. The Watson name grew slowly along that line, and so Robert Jamieson paid homage to his friendship with John Watson for generations after, even if they didn’t know it. There weren't many Watson Jamiesons in each census, and I soon found that all the ones that turned up in the UK were related to that original one. It was fun to work out how they related. Anyway, I digress. My ancestor's doings caught me into the past. Discovering that my great, great grandfather was the manager of the then prestigious Bell’s Pottery in Glasgow, having worked his way up through the ranks from ‘presser’ to ‘potter’ to ‘manager’ was another story I enjoyed researching. Some of my ancestors' occupations included a few weavers, a teacher, a potter, New Forest gypsies who tended to be simply called labourers (including one bought to trial for horse stealing) and a carpenter. So many little details brought each person to life. Genealogy: little snippets bring a person to life. You’d think I might straight-away run to the computer and look up Elizabeth Cellier, the woman whose bold and lively personality had me turning the pages with the eagerness of an undiscovered treasure map. 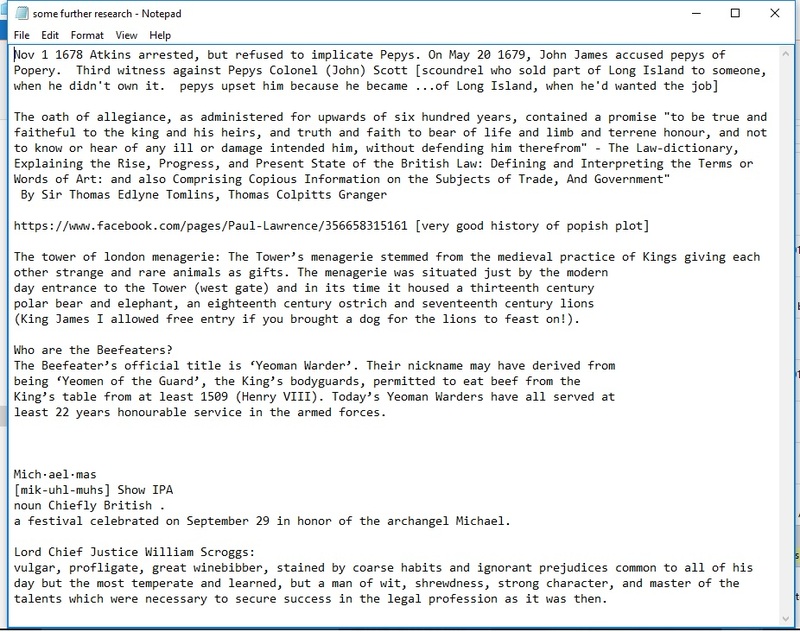 But, to be honest, it was still early days for me on the information highway and, though I’d found out a heck of a lot about my ancestors online, it never occurred to me that Elizabeth wasn’t a total unknown. I’d never heard about her in history class. Later, I leafed through the copy I’d made of the trial and idly wondered whether there would be anything at all online about this strong woman; I really didn’t expect there to be. I was wrong. Straight away, I was excited to find a copy of the original trial documents. Then I found the book, Malice Defeated, that she’d written and the trial I'd got referred to. Excitement turned into a research frenzy. Digging deep, I found lots of references to her, one reference leading to another. The old genealogy bug raised its antennae and pretty soon I’d pieced together that this woman had her fingers in many pies – midwifery, writing, politics, charity - but it was all in pieces. She was more fascinating than I ever gave her credit for and I wanted to tell her story. But, hey… I’m no historian. Surely I can’t write a historical novel without having expertise in history? It’s true, at school I was more interested in the sciences, particularly physics and biology. I was into robots, space and modern medicine. So, I put aside my curiosity of the past to concentrate on the future. I have always considered history a weak area of my education. And, yet, here – unexpectedly – was a story I wanted to, had to, write. How could I possibly be so arrogant as to think I could write a story about a woman in a period I could barely remember basics about, let alone have a clue how she might actually have lived? But, that didn't stop me wanting to write her story. I really wanted to. It was a need. A compulsion. So, I wrote her story without any of the detail, everything I knew about my new heroine. I woke up at 6am and wrote for a while then, after I returned from work, walked the dogs, fed my kids and did all the dreary things I had to do in a day (I’m talking housework – scurge of my life!) I would try and write a bit more in the evening. A couple of months later, I had the story down from beginning to end, but so many square parenthesis marks ‘[…]’ to show missing facts, or things I needed to find out that it was almost more of them than story. But, that was fine, I thought. I had to start somewhere, and getting her story down was the hardest part. Ha! Little did I know! So, then came the real work. Reading about every character in the book, finding out everything I could about each of them, how everything I found fitted together in wider society. All the time, I was building up a large file of images of Elizabeth Cellier herself, I also added those of all other characters she bumped up against, many of them being historically well known. The other people Elizabeth related to needed to be real too. 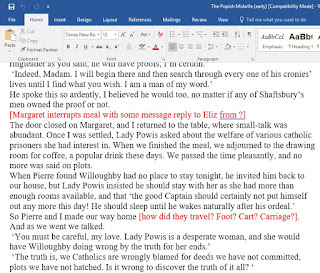 Luckily for me, Elizabeth had related chunks of conversation in her book, which I integrated and adapted as part of the dialogue in my book. 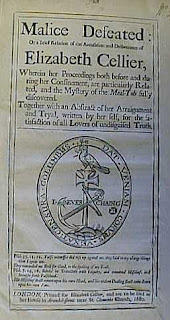 After months and months of reading trial notes, as well as broadsheets and pamphlets of the time, seventeenth century language became like a second language to me (though I had to dampen it down a little for modern consumption and readability – another topic for discussion entirely). But it was those other little details that took the most time to get right, like ‘what did they eat and drink?’, ‘what did they use for lighting?’, ‘what were the roads made of?’, ‘what was their knowledge of things, such as science?’. The latter details, though I was so tempted, I didn’t actually use, but put in a folder for future consumption. The book was already growing too big! However, as any writer and reader knows, you can’t ‘fact-dump’. It’s best not to simply use everything you find, but weave only what’s relevant to your main character into the story as she interacts with these things. I’ve read some excellent stories, where it’s obvious the author has just been so excited to find out all the little everyday details that they’ve felt they simply have to fit them in somewhere, either that or they’ve felt that putting them all in will make it more ‘real’. I put in only a small amount of my research, but, hopefully, the rest of it has come out in smaller ways. Sometimes, it's a case of just knowing a detail can stop you making a faux pas of stating something untrue. The editing is so hard for any book. One read-through after another, picking up different things each time. But editing historical fiction, there’s an added problem. Say you have to cut a scene by two thousand words (Elizabeth’s second trial scene, I discovered, was eighteen thousand (yes, seriously!) words and even I knew it was too long) – what do you take out? If that was how it happened, would it lose credibility if a certain part was removed? What if you removed a witness or two? What if you removed a scene that had nothing to do with the story, but was central to showing her character? One scene that I removed was of Elizabeth Cellier meeting Samuel Pepys in The Tower of London. I haven’t found one bit of information that she met him, anywhere. 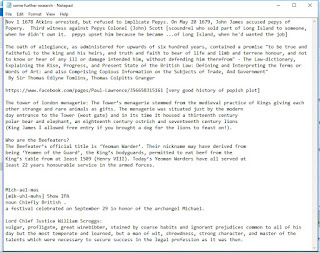 However, she was a regular visitor to The Tower, visiting and doing errands for the five lords imprisoned there for their supposed part of The Popish Plot. Who’s to say she didn’t meet him? 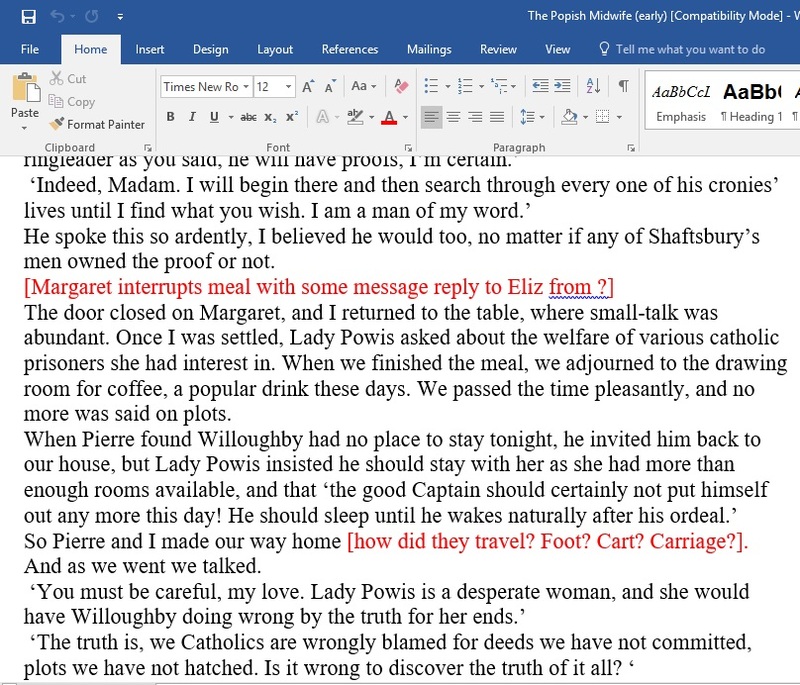 Or, why wouldn’t she have had a conversation about Pepys’s imprisonment, when it would obviously have been a great talking point between the lords and of great interest to herself? But, while it would’ve been interesting for to me to put it in, it was a distraction from the story. I took it out. Finally, The Popish Midwife was finished. I no longer felt, or feel, ignorant about the subject matter. The seventeenth century is no longer a gap in my knowledge. I found out so much about it, and my heroine’s life, I almost feel I might’ve lived through that period. Where once I feared being exposed as some kind of fraud, someone who knew nothing about what I was writing, now I can confidently say that everything I wrote was as accurate as I could make it. I became an expert by writing the story I had no expertise in. 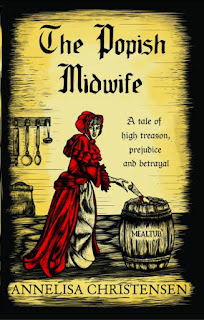 Funnily enough, recently, when re-reading the first chapters, I actually came out in a cold sweat, hairs stood up on my arms, because I thought I’d totally messed up a detail about one of the minor characters, another real-life midwife whose story I’m now writing – Marie Desormeaux. 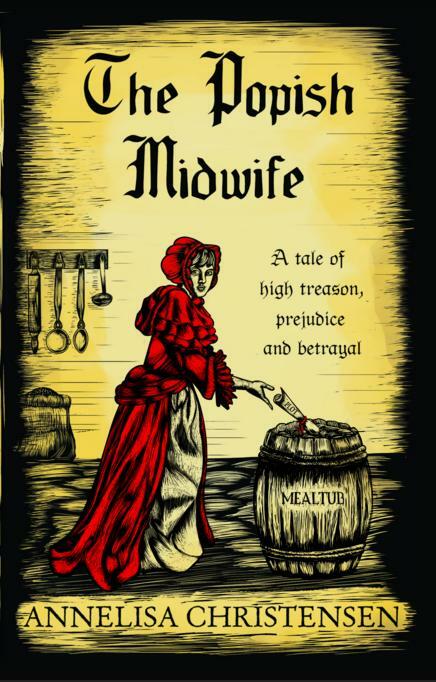 I had called her a Huguenot, and yet I knew, yes, knew, the whole reason I’d discovered her was because she’d also been called ‘The Popish Midwife’ on a set of playing cards. Oh my, how I fretted! If there was one wrong detail in the book, would everyone point at me and ask how many other things were wrong? Would it destroy my credibility as a historian story-teller? Would my rep be in ruins? I would have to change it – obviously! But, there was a niggle. Why had I called her a Huguenot, when she was obviously Catholic? I went back to my notes. Yep, there it was, Catholic, BUT… yes! There it also was. She had begun life in London as a Huguenot. What a relief! My rep was no longer in tatters. So, really, what would be the big deal if I’d made that ‘fact’ up? So what if I fudged a fact to make it fit my story? Would that have been so bad? As Andrew Taylor said at that same HNS conference, ‘First and foremost, we are telling stories, engaging the reader. The most important thing is the story. Without the story, it is nothing.' Margaret George added, ‘The gaps in sources leave wiggle room to answer the question, ‘What makes them tick?’. Truth be told, there are a lot of pure fiction stories simply set in the past, and there is nothing at all wrong with that. And there are probably as many again where a person/event from the past is used as a basis for the story, but where the story is all made up. Again, there’s nothing wrong with that. But, for me, having every known thing correct was important. I wanted it to be as close as I could get it to real events, to relive those few years with Elizabeth. Of course, I wasn’t there, and can’t really be sure of what happened. So my melded events and facts with fictional scenes had to made sense to me, scenes I felt sure had to have happened for the other known events to have happened. And that’s what makes the story fiction rather than non-fiction, even though it’s as close to what I know as I can make it. It’s the fiction that brings Elizabeth’s story to life, rather than simply describing events. It’s the ‘supposing’ what happened in between, guessing what her motives were that make her story human. So now, if I state the very first sentence again: "You're not a historian, you’re a fraud. How dare you write a historical fiction novel?" I beg to differ. 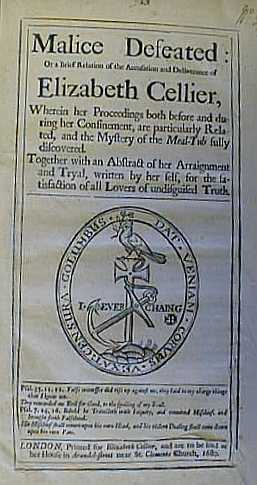 I have become a historian of Elizabeth Cellier’s life, by my very research of it. I didn’t know anything but, through research, I now have a much better understanding of the time. I take great satisfaction, though there may indeed be details I’ve missed (for instance, the social knowledge of science, of which I’m sure Elizabeth would have some idea of, considering her intelligence and learning), I do know that what I have put in is accurate as far as I could possible make it. My point? I would advise anyone, now, not to be put off writing a story they want to tell, but they worry they don’t know the period. Write the story, fill in the details after. Anyone can become an expert if they put in the time and effort. Have you ever been caught by a story you'd love to write, but didn't feel qualified to do so? I so wanted to know about this novel in detail since I have heard alot about its author and story line.Thanks for sharing about this novel in such detail.